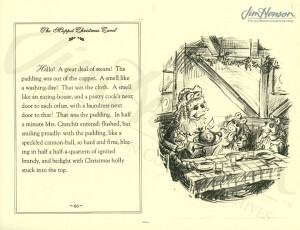 Retailers in New York are known to have some of the most elaborate holiday window displays in the country and the famous Fifth Avenue jeweler Tiffany’s is no exception. 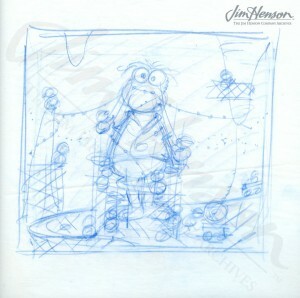 Jim had an apartment just a few blocks up the street and ordered his custom personal stationery from the store. 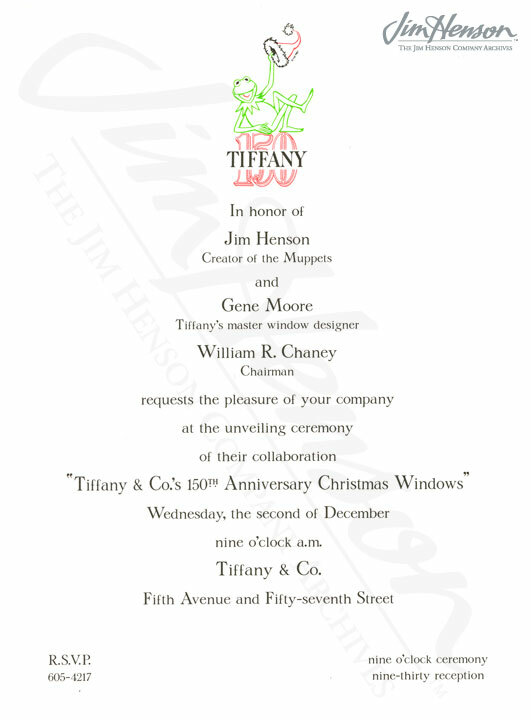 It was an honor, in 1987, to be asked to create the holiday windows for the store’s 150th anniversary, and Jim and his art director Michael Frith were pleased to work with illustrious Tiffany window designer Gene Moore. 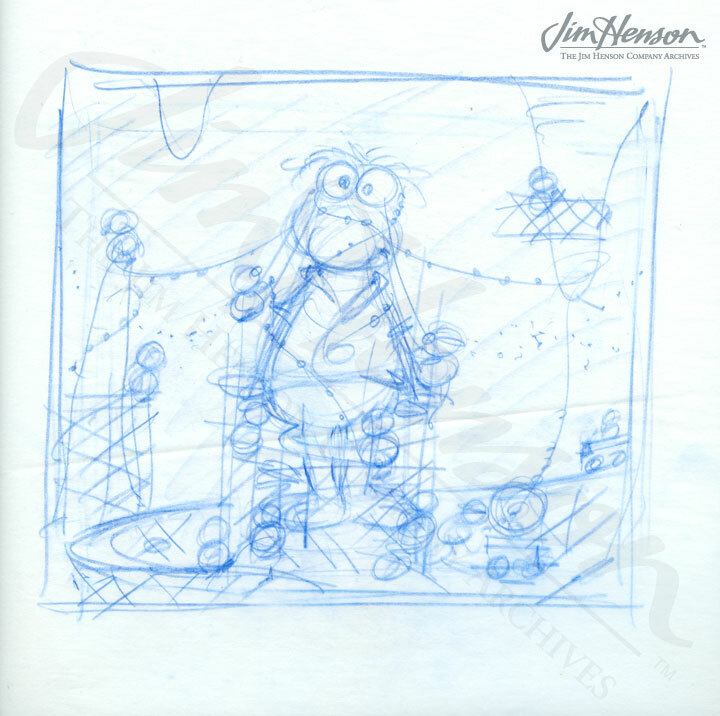 A range of characters were included from Sesame Street, Fraggle Rock, and the Classic Muppets. 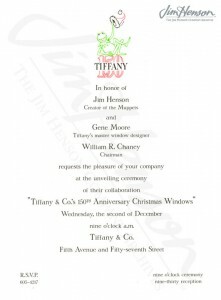 Invitation to the unveiling of the 1987 Christmas windows at Tiffany’s. Michael Frith’s design for the Fraggle Rock window at Tiffany’s, 1987. 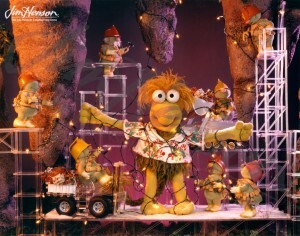 The Fraggle Rock window featuring Wembley at Tiffany’s, 1987. Miss Piggy consulting with window designer Gene Moore at Tiffany’s, 1992. Storybook page illustrated by Michael Frith from the Tiffany’s Christmas windows, 1992. 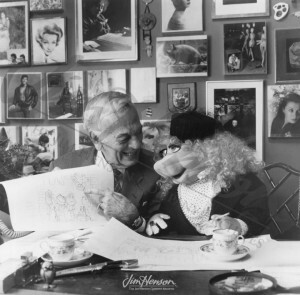 This entry was posted in 12-December '87, 1987, Muppet Show and tagged Fraggle Rock, Gene Moore, Jill Rappaport, Merrie Davis, Michael Frith, New York, Sesame Street, The Muppet Christmas Carol, Tiffany. Bookmark the permalink.